In this lab, students perform a Gram stain on various species of bacteria. The results, after observation through a light microscope, allow each sample to be designated either Gram negative or Gram positive. Students then describe the unique properties of each type of bacterium's cell wall and the mechanism through which the bacteria are differentiated during the procedure. 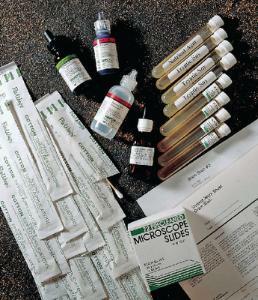 Ordering information: This lab contains 1 box of pre-cleaned microscope slides, 1 coupon redeemable for five microorganism cultures and additional media, 20 sterile culture swabs, a teacher's guide, students' guides, and stains and decolorizers for a gram stain test. A microscope with an oil-immersion objective, oil for oil immersion objective, clothespins, burners, paper towels, and distilled water are needed but not included. Delivery information: The kit will ship separately from the live component. Kits do not contain perishable components and generally ship via UPS ground. Perishable components will ship via overnight or second day delivery.